SAN MATEO, Calif., and ZARAGOZA, Spain—September 16, 2014—Libelium has released new Smart Logistics modules for Waspmote sensor nodes that provide position, sensing and transmission capabilities to enable real time tracking, via 3G, GPS and GPRS. These new modules for Waspmote and Plug & Sense! devices can read geolocation coordinates, collect extra sensor data such as humidity, luminosity, CO, CO2, temperature, or vibration, then send all the information to a web or Cloud server. Smart Logistics applications include continuous vehicle fleet tracking, container goods control, and asset management, or other location-based services. To guide developers, Libelium has created libraries detailing GPS and sensor data transmission, and an example of how to integrate information gathered with geographic information systems such as Google GIS, Axeda or ESRI. A step-by-step tutorial on geopositioning with the Google Maps API is also available in the technical guides published by Libelium. Technical points – Smart Logistics modules for Waspmote / Plug & Sense! Real-time tracking is performed by reading longitude/latitude, collecting sensor data, and transmitting via an HTTP request to a Web/Cloud server. Waspmote easily adds sensor data from any of over 70 different sensors (e.g. acceleration, CO, CO2, humidity, IR, luminosity, temperature, vibration, liquid presence, etc.) to location data and sends the information to any Cloud system. Available wireless technologies include 3G, GPRS, Wi-Fi, ZigBee, 802.15.4, Bluetooth, Bluetooth Smart Low Energy (BLE), GPRS, RF-868MHz, RF-900MHz, Wi-Fi, ZigBee radio interfaces. Waspmote sensor nodes simplify connectivity. 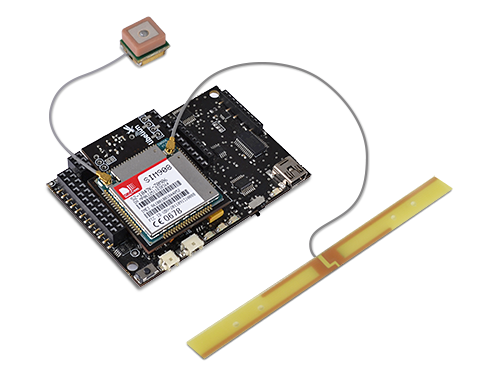 - SIM908 / GPRS+GPS, for basic GPRS transmission Two options available for Waspmote / Plug & Sense! nodes, according to specific use requirements. 800/1900/2100MHz (JP) Modules are compatible with all the world’s major cell networks. GPS: the SIM5218 can use complex GPS modes that can complete information with mapping info from A-GPS / S-GPS geolocation servers Position information is useful for real time monitoring of shipping containers, vehicle fleet tracking, for insurance, transport, and security purposes. Certifications obtained for both modules for CE, FCC, IC; SIM5218 module is also certified Telec, and Jate. Modules are ready to deploy in Europe, Japan and the U.S.
For more information about Smart Logistics contact the Libelium Commercial Department.